After the greatest summer of his life, Danny Andrew is looking for a season to match. As well as joining Rovers from Grimsby Town, the 26-year-old welcomed his first child during the off-season. “It’s been a different summer from what I’ve been used to,” he said. “Usually it’s a couple of holidays but this summer it’s been cleaning nappies and sleepless nights. “My fiancee is really good. She helps me through the night. “Through pre-season it’s been tough training. She does most of the stuff through the night and I get up with him in the morning and let her have a couple of hours while I get ready for training. 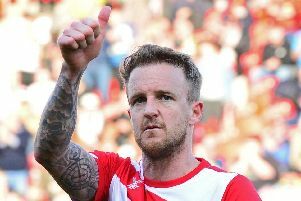 While he continues to get his teeth into parenthood with son Carter, Andrew is ready to tackle life with Rovers and his own long-awaited return to League One - provided he can cope with the sleepless nights. Andrew enjoyed a superb season with Grimsby, scooping almost every award at the end of season dinner. The full back could have remained at Blundell Park, where he was offered a new deal, and several other clubs were interested. But Rovers had caught his eye when he came up against them as a Mariner last term. He said: “I played against them last season and they way they played, I really took it to me. “How high the full backs got – I really wanted to be a part of it. “After speaking to the gaffer, it was a no-brainer for me. Andrew has experienced League One football before but endured a tough time at Fleetwood Town where injuries blighted his two-year spell. And he admits he feels he has a point to prove in the third tier. He said: “I was unlucky with injuries at Fleetwood so I had to take a step back. “I think I played about 17 games which isn’t enough. “I’ve definitely got a lot to prove to myself as well and give myself belief that I can do it at this level. “The aim was always to get back. I didn’t want to drop out of it but I had to. “Now I’m here, I’m so determined to stay here and hopefully go even further. Do that and it truly will be an unforgettable year for Andrew.